In Australia, we certainly believe in the saying, ‘the bigger the better.’ Whether it is a big piece of fruit, animal, or even a cigar, it seems as though Australia loves its list of endless Big Things. Sure, Australia is home to some of the world’s most beautiful beaches and delicious food and coffee, but it is our giant statues that truly make our towns and cities iconic and memorable. Since there are hundreds of Big Things in Australia, we have narrowed down a list of 15 standout icons to check out during your next East Coast road trip. Say the word ‘mango’ and we can instantly feel the warmth of a tropical summer’s day. So, it only makes sense that this 10-metre high mango is found in the tropics of Bowen. The Big Mango, which can be found at the Bowen Visitor Information Centre, is so iconic that it was kidnapped back in 2014. As it turns out, the Nando’s food chain pulled this stunt for a bit of a laugh, but it sure had people temporarily worried. If you love your peanuts, you will need to visit The Big Peanut Man in Tolga. This attraction has been around since 1977 and is still is a big tourist attraction for those who are in the Cairns vicinity. Word on the street is there is a petition for another big peanut to be built in Kingaroy, so stay tuned! Let’s be real, it would be a crime if there wasn’t a giant rum bottle in Bundaberg. You will find this iconic 1988 statue outside the Bundaberg Rum Distillery, but there are a bunch of other big rum bottle replicas floating throughout the state. The Big Watermelon is the latest addition to Australia’s list of Big Things and we couldn’t be more excited! The 9-metre long watermelon can be found at the ‘melon capital of Australia’, Chinchilla. Let’s be real, watermelons are a fun and aesthetically pleasing fruit, so there’s no doubt this Big Thing will be a huge hit with tourists. This iconic heritage-listed pineapple can be found sitting pretty at the beautiful Sunshine Coast. The Big Pineapple has been a big hit with tourists since 1971 and has even attracted the likes of Prince Charles and Lady Diana. After taking a selfie with the pineapple, you can even hop aboard the pineapple train or caffeinate yourself at the pineapple café! When we think of Big Things, we instantly think of the legendary Big Banana. Located along the Pacific Highway in Coffs Harbour, The Big Banana is undoubtedly Australia’s most renowned Big Thing! This tourist attraction is now a full-on water park, but you can also learn about the banana industry and enjoy some food while you’re here. If you are a country music lover, a visit to the Big Golden Guitar is an absolute must. Tamworth is Australia’s home of country music, so we wouldn’t expect to see a big shiny guitar in any other location. This giant guitar is even a replica of the golden guitar awards handed out annually at the Australian Country Music Awards. Yeeha! Did you know this 9-metre 1989 crustacean was originally built without a tail? In 2013, Bunnings Warehouse decided to give the Big Prawn a makeover and finally grant him a tail. These days, the restored icon can be found near Bunnings Warehouse on River Street in Ballina. We’d be pretty shocked if there wasn’t a big farmer statue somewhere in Australia. This sentimental Big Thing took 17 years to conceptualise and build – just the carving on the statue even took two years! The Australian Farmer (aka the Big Farmer) represents all of the early settlers in the Wudinna region. The Big Santa has been a Christmas tradition in the Rundle Mall in Adelaide since the 1960s. Since 2015, this beloved statue has resided outside the Central Market on Grote St due to a renovation on the David Jones building that no longer allowed the Big Santa to fit securely. This Big Thing was built along The Esplanade in 1975 in the Tasmanian town of, you guessed it, Penguin. Besides this big penguin statue, this seaside town is home to plenty of adorable real-life penguins! If you are an animal lover, then this is another Big Thing destination you won’t want to miss out on. The Big Tasmanian Devil at the Trowunna Wildlife Park is said to be a highlight of any Tasmanian road trip. Getting a photo with this statue is definitely a lot safer than one with a real Tassie Devil! Big fruit and Australian animals make sense, so why a big cigar you ask? This town of Churchill in Victoria was named after none other than British Prime Minister, Winston Churchill who was impartial to smoking a cigar or two back in the day. This particular Big Thing is a replica of the exact cigar he used to smoke. Melbourne is home to some of Australia’s best cups of coffee, so a big coffee maker in Victoria is a no-brainer. 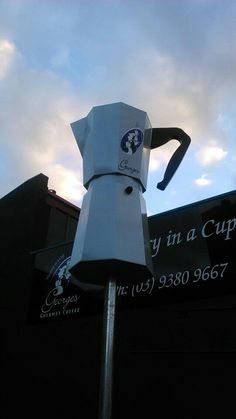 You can find this tourist attraction outside Georges Gourmet Coffee in the suburb of Brunswick. Why not head on a trip along the Great Ocean Road after stopping by this hotspot? This 12-tonne Giant Koala has been around since 1989 but was given a new identity back in 2009. The Giant Koala was renamed Sam, after Australia’s iconic real-life koala, as a way to raise awareness for the diminishing koala population. The real Sam koala tragically suffered from third-degree burns and lung damage from the Black Saturday bushfires.